Company - ADM Associates, Inc.
ADM is the longest-running energy evaluation firm in the United States still operating under its founding leadership. In 1979, ADM’s founding principals, Taghi Alereza and Donald Dohrmann, formed ADM Associates after determining they were uniquely positioned to fulfill the need for energy research premised on both engineering and economic principles. Dr. Alereza and Dr. Dorhmann possessed the knowledge and abilities to provide superior energy research and evaluation services to utilities as well as public sector and other entities. Our innovative accomplishments extend from ADM’s founding through to the present day. Developed a simplified energy calculation method to support the development of the Department of Energy’s initial residential standard—Building Energy Performance Standards (BEPS). During the course of this work, Dr. Alereza developed the Variable Base Degree Method (VBDM). This method is cited in the ASHRAE Handbook – Fundamentals, as a simplified method for calculation of energy use in residential buildings. Developed the first hourly simulation modeling software that work with microcomputers. We subsequently developed a pre-processor for DOE-2, which served basis for the later development of eQUEST. First designed, developed, and implemented demand control ventilation (DCV), and first identified learning thermostats as an innovative approach to achieve residential energy savings. Pioneered the development of duct leakage testing procedures and performed extensive training of HVAC technicians that lead to the proliferation of duct leakage testing and repair. Our team of engineers, social science researchers, and analysts has developed innovative energy research and program evaluation strategies, which have been presented at the International Energy Program Evaluation Conference (IEPEC) and other professional forums. Our multi-disciplinary staff facilitates efficient, comprehensive energy efficiency program evaluation. 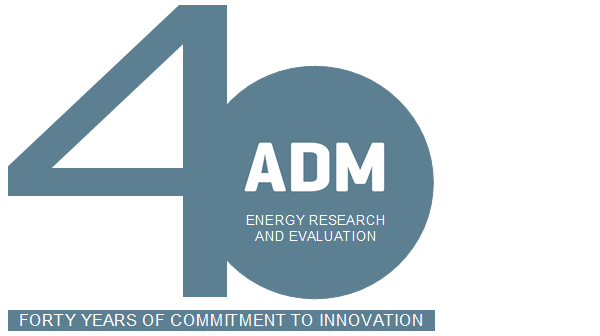 We maintain the commitment to provide superior energy research and evaluation services on which ADM was founded.